When Jed and I first entered the Providence theater scene we were enthusiastically advised to volunteer with The Manton Avenue Project. We jumped into our first MAP production in 2010. Jed played a rich man who went to Wal-Mart to buy a computer and I played a dog who who was also a lumberjack. Over the years we continued to volunteer when we could, and our mutual affection grew. Eventually Strange Attractor even purchased a button maker with MAP, which cemented our bond in commerce. At some point committing to the MAP schedule became difficult. Show after show came and went without us, while we made our own shows happen, knowing we couldn’t be everywhere at once and that both of our organizations were contributing to the health of Providence. Anytime I’d apologize for not being able to volunteer MAP's generous director Meg Sullivan would say, “Don’t ever apologize” and give me a big hug. When Marc Boucai at AS220 created the Community Live Arts residency, Jed and I knew that Before We Begin would be an interesting project to propose. A personal artistic experiment requiring large-scale space demands, it was the kind of non-play play that would be fun to create in the unjuried uncensored environs of AS220. That the residency required 30 volunteer hours with a non-profit was a bonus. We decided to ask Meg at Manton Ave to collaborate. The young playwrights at Manton Ave took to our physical playwriting techniques with more enthusiasm and joy than many adults. We asked them to find empathy with the physical world around them -- to become sugar cubes melting, fire growing and being extinguished, balloons being blown up and let go. 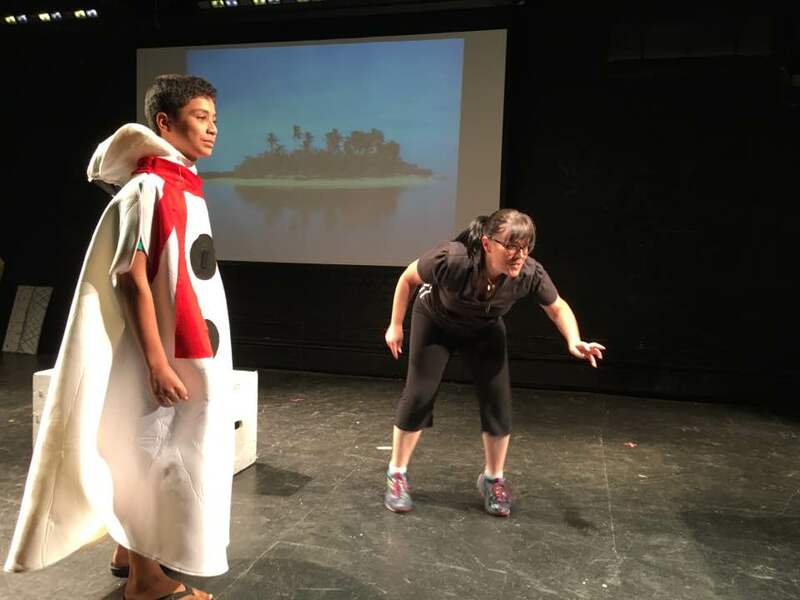 For young playwrights who routinely create characters from animals and inanimate objects, these leaps of empathy were pure joy. After one class we reflected with Meg about her incredible kids, and she said people will sometimes say that MAP teaches young people empathy, but after the past several years, she’s come to realize that the kids don’t need to learn empathy -- they teach it to us. Now we’re in the theater, on the verge of this new batch of plays, created using physical theater techniques with audience interaction, written in the woods of New Hampshire, in the MAP Clubhouse in Providence and with the input and care of adults who are more than willing to let these young playwrights lead the way and will assist in telling their stories with generosity and love. Jed and I keep remembering that we ended up here because we decided to make a play, and that play was accepted into a residency program that asked us to go farther than our show. Making Before We Begin was incredible, but by volunteering with MAP this summer, we’ve extended that creative impulse well beyond the walls of our own performance. While we wrap up our own Community Live Arts Residency this weekend, we can’t help but imagine all of the other projects upon projects that will happen in Providence because of this multi-layered opportunity, and we hope all of them have the multi-layered heart-opening process of creation that we have.